She’s one of America’s fairest and funniest ladies. Actress and screenwriter, director and comedienne, Fannie Flagg is also a most accomplished and high-spirited author. Said Kirkus of her first book, Coming Attractions: “It’s subtitled ‘A wonderful novel’ and that’s exactly what it is.” Here is her second. Get ready, because it’s going to make you laugh (a lot), cry (a little), and care (forever). What is it? It’s first the story of two women in the 1980s, of gray-headed Mrs. Threadgoode telling her life story to Evelyn, who is in the sad slump of middle age. The tale she tells is also of two women—of the irrepressibly daredevilish tomboy Idgie and her friend Ruth—who back in the thirties ran a little place in Whistle Stop, Alabama, a Southern kind of Cafe Wobegon offering good barbecue and good coffee and all kinds of love and laughter, even an occasional murder. And as the past unfolds, the present—for Evelyn and for us—will never quite be the same. 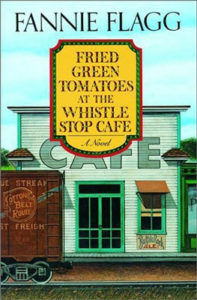 Fried Green Tomatoes at the Whistle Stop Cafe is folksy and fresh, endearing and affecting, with humor and drama—and with an ending that would fill with smiling tears the Whistle Stop Lake…if they only had a lake….